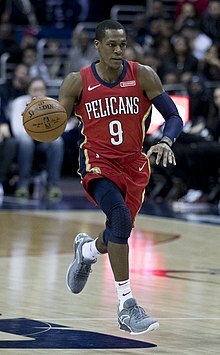 ^ Rajon Rondo. ESPN.com. [2007-03-12]. ^ Springer, Shira, No catching Rondo 互联网档案馆的存檔，存档日期March 3, 2016，., The Boston Globe, May 17, 2009, accessed July 20, 2009. ^ Kentucky G Rondo to hire agent, test draft prospects. ESPN.com. 2006-04-04 [2007-03-12]. ^ Celtics Acquire Draft Rights to Rajon Rondo and Brian Grant. NBA.com. [2007-03-12]. ^ Ahmadi, Arya. Mavs acquire four-time All-Star Rajon Rondo. NBA.com. December 18, 2014 [December 18, 2014]. ^ Wiggins scores 22 as Timberwolves beat Kings 101–91. NBA.com. November 27, 2015 [November 28, 2015].